Having overheard this exchange, my boss took me aside and explained in rather heated words that if anyone asked if the pudding was homemade, I was to tell them it was. I was not to mention cans or can-openers or anything of the kind. The pudding was made on the spot. Period. I appreciated her stance on the subject, but I was uncomfortable lying about the food. Perhaps it’s not surprising that I wound up unemployed a shortly afterwards. Recently, I was at a bead show in Tucson, helping my sister sell her handmade glass beads. Once again, I was dealing with the public and I had to fight my tendencies to tell the exact truth to our potential customers. Presenting a positive face to the public is crucial in face-to-face sales, and I was constantly having to bite my tongue when asked, “How are you?” or “How’s it going?” Lots of things went wrong right from the start. One of the challenges we faced was a late arrival due to flight delays. As a result, we had to get up at 5 am to set up before the show opened at 10. It was a race against the clock that left us both exhausted and wired, but the buyers didn’t need to know that. When I walked around the show myself, I got a strong lesson in the importance of staying positive. Some of the sellers were not making much money. Like us, they were tired and stressed. Unlike us, they talked about it — a lot. As a potential customer, I found their negative comments unattractive. I might commiserate with their situation, but I didn’t want to stick around their booth once they’d finished their tale of woe. If they were hoping I’d buy something out of pity, it didn’t work. I wanted out of there, away from the clouds that hung over their heads. 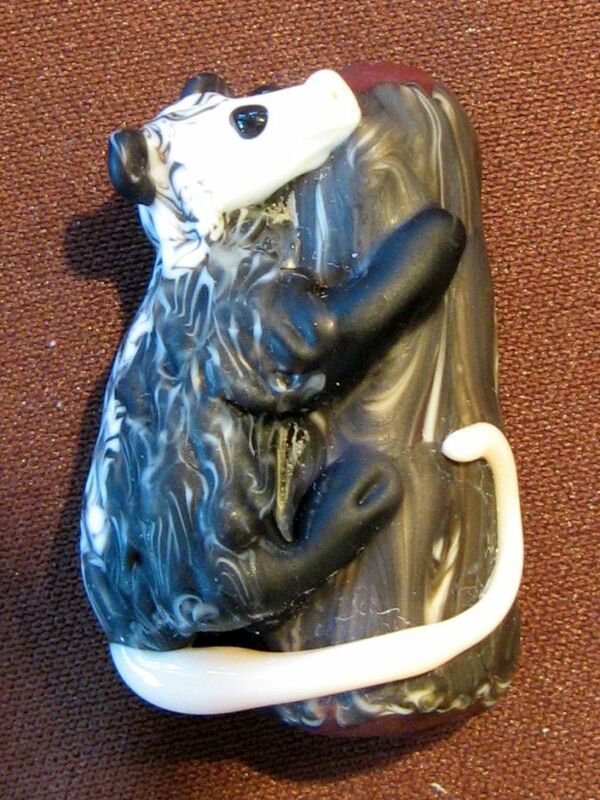 My sister recently got a commission to make a possum bead. I was surprised anyone would want a bead of an animal most people equate with roadkill, so I looked up the symbolic meaning of the possum. According to Animal Speak by Ted Andrews, the possum is about how we appear to others. 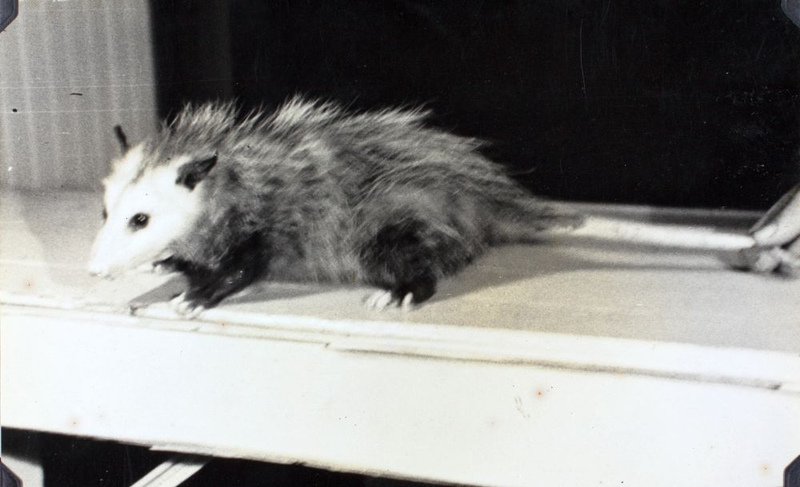 Known for playing dead to keep from being attacked, the possum lies to save itself. Sometimes, we need to “play dead” and present a false front in order to protect ourselves or others. Knowing this about the possum didn’t make it any more attractive to me, but I did realize that this was a skill I needed if I was going to help my sister with her sales. …although Cleo’s possum bead is pretty darn cute. I never really got comfortable with possum mode, but there was one moment when I realized its true value. A woman came up to the table looking for a bird bead she’d admired earlier. “Sorry, it was sold,” I said. I nearly told her the rest of the story, that someone had bought it as a gift for a friend. My possum kicked in and I held my tongue. Only then did I realize that the woman who’d bought the bead was standing right behind the first woman. The disappointed woman was the one who would be getting the coveted bead as a gift later. Thanks to my possum I didn’t blurt out the truth, and the surprise stayed a surprise. I was so proud of my inner possum that I gave the buyer a conspiratorial wink before she walked away. “As a man thinketh, so he shall become.” (I’m thinking that applies to women too. 😉 ) Practicing positive often leads to the real thing. Most people who ask, “How are you?” don’t really want to hear more than “Fine. How are you?” I reserve my kvetching for the select few that truly care to listen I only reach out when I absolutely need to vent, and do my best to return the favor–or pay it forward when it seems appropriate to do so. Due to therapy work, I’ve learned to be much more honest when people ask me how I’m doing. I used to cover up what I was really feeling with an ever-present smile. Now I have to fight to do what used to be automatic! I do try to focus on the positive whenever I can, but I also try to see things as they are, and to acknowledge how I’m being affected by what’s going on. If I pretend I’m OK when I’m not, the suppressed feelings can come flying out unexpectedly and inconveniently. Plus I get sick with all the trash I’m carrying around. I’ll keep working on finding balance with this, and also remembering that sometimes the right thing to do is get my possum on. Stuffing feelings is definitely counterproductive in the long run. As you stated, it’s about finding the balance. I like the ‘possum’ analogy–never thought of it that way. I would never have thought of playing possum as a good thing, either. But I love useful analogies so I’m adding this one to my arsenal.